The longest river in Scotland is the Tay (120 miles) and is one of the best salmon fishing rivers in Scotland. The Spey (110 miles) is the second longest river and is famous for the whisky distilleries around it. The Clyde (106 miles) was famous for the shipbuilders that were here from the 19th century. The Cunard liner Queen Elizabeth was built at John Brown’s shipyard here and was at the time (1938) the biggest passenger liner ever built. The other major rivers in Scotland are the Tweed (97 miles), Dee (85 miles), Don (82 miles) and Forth (65 miles). 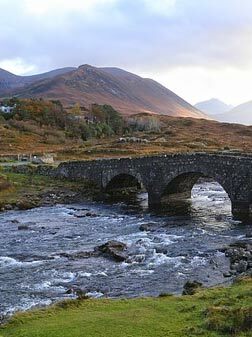 Of the other rivers in Scotland, 26 flow directly into the sea. There are approximately 31,400 lochs (and 1 lake) in Scotland. The word loch is Gaelic for lake, while a lochan is a small loch. At over 25 miles long Loch Awe is the longest inland loch; Loch Fyne is the longest sea loch. Loch Lomond, at almost 25 miles long and five miles wide at its southern end, has the largest surface area. Loch Ness, at 600ft deep for most of its 23 miles, has the largest volume of water – more than all the lakes and reservoirs in England and Wales combined! The deepest is Loch Morar – over 300m (1000ft), a depth that is not reached for over 130 miles in the Atlantic. Loch Nevis, to the north of Morar, is the deepest sea loch.